My heart goes out to everyone affected by the senseless acts of violence at the Boston Marathon on Monday. Being a runner, this news was especially heartbreaking. I just kept thinking how it could have been me at the race and an even scarier thought, how it could have been my loved ones waiting at the finish line. I was actually planning on going out for a run when I first heard the news. I was glued to the television most of the day and as the horrific and devastating images and videos surfaced, I clasped my hands over my mouth in disbelief. I cried this morning when I saw the images of the 8 year old boy that was killed yesterday. There is a heaviness at the center of my being and I just can’t grasp the madness and inhumanity that exists in our world. Rising above that inhumanity yesterday was the outpour of support and compassion in Boston and all over the world. I was so touched by the growing list of people in Boston opening up their homes for stranded runners, runners continuing to run to nearby hospitals to donate blood, and strangers helping each other to safety. 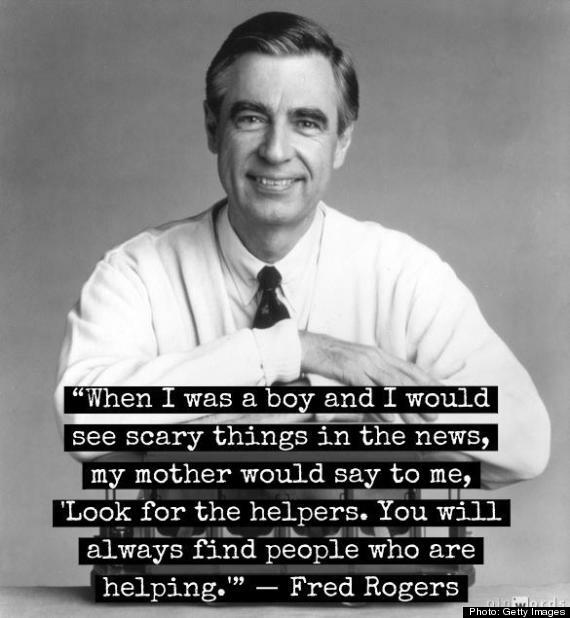 One image/quote that kept circulating social media sites that exemplified these acts of kindness was one of Mr. Rogers. This image truly inspired lightness and hope in me and clearly, many others. So in case you haven’t come across this yet, I wanted to share it and hopefully, it can bring some solace to such a tragic event. Today, I dedicate my run and my yoga practice to Boston and everyone around the world affected by these senseless acts of violence. This entry was posted in Hump Day Inspiration, Running and tagged Boston, Boston Marathon, helpers, inspiration, kindness, Mr. Rogers, running by brokeassyogi. Bookmark the permalink.